Barrier Security Products has an extensive range of Machinery Guarding and workplace zone fencing called De-Fence. This product is very popular around milking machines, dairy farms, wool presses, wineries, fruit packing plantations and wherever the separation from working machinery and pedestrians is required. De-fence modular mesh panel come in a variety of lengths from 3800 to 1880mm mesh infill 25 x 25 x 3mm wire. When used with De-fence posts and brackets panels can be either fixed if bracketed on both sides, or alternatively any panel can act as a gate simply by bracketing one side only, all panels are capable of swinging through 180 degrees. When used with double height De-fence posts the panels can be stacked 2 high using the appropriate brackets. Panels are powder coated black for improved see through. Light weight and easy to install the De-fence safety guarding system is designed to comply with AS4024.1 :2006 Safety of machinery. Popular in workplaces where guarding of machinery or walkways is required De-fence Machinery Guarding and workplace zone fencing comes with variety of options including in-ground post kit, self closing gate bracket, gate stop, lokk-latch general release and lokk-bolt security drop bolt . 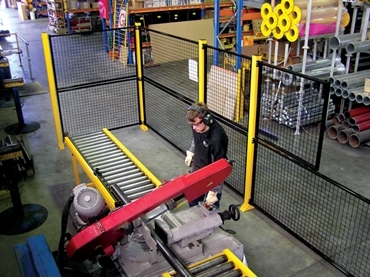 Barrier Security Products can deliver De-fence Machinery Guarding and workplace zone fencing Australia wide.